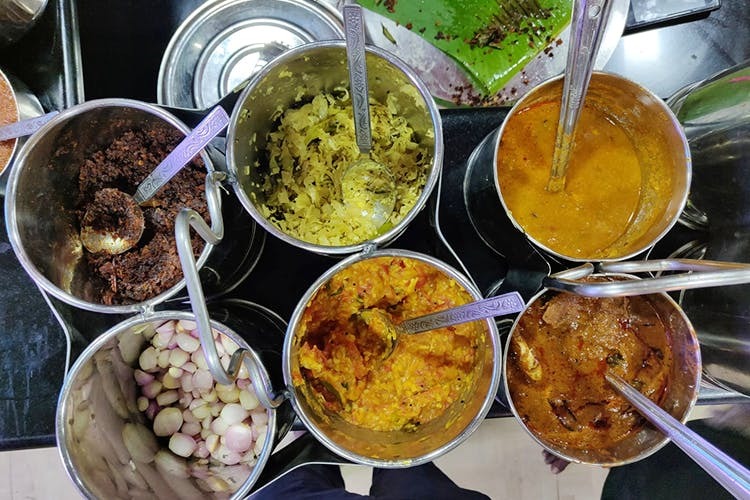 Head to New Pattukottai Kamatchi Mess at Old Mahabalipuram Road for traditionally cooked Chettinad non-vegetarian delights. This tiny mess, tucked in Karapakkam, Old Mahabalipuram Road, is truly a non-vegetarian’s paradise. Open only from noon to 4 in the evening, the food is freshly cooked every day. The head chef, Surrendar has done away with the gas stove and everything is made in a wood fire stove. Staying true to the traditional methods, the first thing placed on the banana leaf is shallots that is believed to be good for digestion. The finely minced karuvadu curry was a change when compared to the karuvadu varuval. Their vanjaram fry (seer fish) was crispy and had a tinge of ghee in it which made it delectable. My companion gave full marks to the mutton chukka that was prepared in a pepper base and was high on spice. The prawn masala was tangy and juicy and went perfectly with plain rice. One of the highlights of the meal was their karandi omelette, which is nothing, but an omelette made in a ladle. Enjoy this bajji-like-looking-omelette with parupu sadam. With each dish boasting a different flavour, we enjoyed this heavy-meat-meal and ended it with the Kovilpatti Kadalai Mittai (chikki), which was a refreshing change than the usual saunf. It is easy to miss the restaurant; better sign boards will definitely help. The restaurant could do with better interiors and cleaner floors. They will soon be selling the original Tanjore Dancing Doll. There is also a T-Nagar branch of the restaurant and the owners are looking at opening new branches in the city.